I recently returned from the Orange County Freethought Alliance conference. Though a local conference, it had an impressive lineup. Of course, they had an advantage with some well-known Los Angeles-area speakers: Michael Shermer (Skeptic magazine), Phil Zuckerman, Jim Underdown, Brian Dunning, Mr. Deity (Brian Dalton), Eddie Tabash, and Heina Dadabhoy (Muslim blogger at Skepchick.org). But they also had some great out-of-towners: Robert Price, Aron Ra, Richard Carrier, Barbara Forrest (expert witness in Kitzmiller v. Dover), David Silverman, and Dan Barker (FFRF). I’ll give some (probably disjointed) highlights. David Silverman, president of American Atheists, said that the next Reason Rally is scheduled for 2016 (location unknown). He also said that Fox News has reported that they will become more centrist. Disfavoring practicing homosexuals in custody matters promotes the general welfare of the people of our State. … The State carries the power of the sword, that is, the power to prohibit conduct with physical penalties, such as confinement and even execution. It must use that power to prevent the subversion of children toward this lifestyle, to not encourage a criminal lifestyle… Homosexual behavior is a ground for divorce, an act of sexual misconduct punishable as a crime in Alabama, a crime against nature, an inherent evil, and an act so heinous that it defies one’s ability to describe it. The [First Amendment’s] Establishment Clause … permits the disregard of devout atheists. Sounds more like April Fool’s Day than that these are the considered opinions of state and federal Supreme Court justices. On a lighter note, Brian Dunning (Skeptoid podcast) gave a puzzle. The full moon is the same size as what held at arm’s length? Is it a ball bearing, a pea, a dime, a nickel, a quarter, a silver dollar, a plum, or a baseball? (The answer is below.) This was an especially apt puzzle since we had a spectacular partial (80%) solar eclipse at the end of the conference. Dunning gave himself as an example of how tenacious false beliefs can be. After he concluded that vitamin C had no effect on colds, it took a year to wean himself off of it. This is like Greta Christina’s gradual acceptance of the lack of evidence for glucosamine as joint medicine or Sam Harris’s Fireplace Delusion. It helps to understand our own blind spots when we try to understand those of other people. Richard Carrier, newly famous because of his online argument with Bart Ehrman about the Jesus Myth theory, talked about the fine-tuning argument. It was a good talk and especially helpful because I’d read Vic Stenger’s The Fallacy of Fine-Tuning and hadn’t gotten the concise summary that I was hoping for. I’ll leave a more detailed summary of this talk for later. Michael Shermer talked about “The Moral Arc of Reason.” He noted that asking, “Why should we be good without God?” is like asking “Why should we be hungry (or jealous or happy or any other human feeling) without God?” These are all natural feelings with plausible natural causes. He used graphs and statistics to argue that things are getting better within society (wars, income, and other social metrics), much like Steven Pinker’s The Better Angels of Our Nature. But why is this not simply an aberration? Why imagine that this is a legitimate trend within society and not cherry picking of the data? Shermer argued for a moral equivalent of the Flynn Effect, the startling effect that has caused an increase in average IQ scores of about three points per decade, perhaps for as long as a century. The Flynn Effect has been (tentatively) explained with the hypothesis that modern society has trained us to be better in abstract reasoning (mentally moving 3D shapes, for example). Perhaps there is a moral equivalent at work as well, that modern society has given us a new appreciation for peace and harmony. I have long been fascinated with the work of Phil Zuckerman, who (along with Gregory Paul) has shown the far better social metrics of less-religious countries compared to the religious U.S. Zuckerman talked about the new Secular Studies major he developed at Pitzer. Barbara Forrest of SE Louisiana University, an expert witness in the Dover trial, says that “critical analysis of evolution” and “academic freedom” are some of the new creationist code words. Jim Underdown is a paranormal investigator who will be on Dr. Phil debunking psychics this week (“Inside the Other Side,” 5/25/12). He noted that the Bible’s miracle claims are similar to today’s paranormal claims, which have been tested and debunked. The one million dollar JREF prize for a successful paranormal demonstration remains unclaimed, for example. The answer to Brian Dunning’s puzzle: the full moon is the same size as a pea held at arm’s length. My guess was a dime, so I need to try this myself to verify it. Played at the conference, here’s Jesus singing “I will survive” (a must-see if you haven’t watched this before). I’m off to the Freethought Alliance Conference in Irvine, CA this weekend, so I’ll be a little slow with blog posts for a few days. This should be an interesting event, with a Who’s Who of atheist speakers—Michael Shermer, Robert Price, Phil Zuckerman, Aron Ra, Richard Carrier, Brian Dunning, Mr. Deity, Dan Barker, Eddie Tabash, and others. I’d like to put copies of my book into the hands of some of these speakers. I’m sure that most won’t read it, but I want to add to my collection of positive reviews and hope that this increases the chance that someone will open doors for the book. As an aside, has anyone noticed that there are more atheist/freethought conferences lately? I’m fairly new to this game—the first conference that I attended in this category was The Amazing Meeting 2 in 2004. But this could simply be my being more aware of them. Let me know if you sense that conferences have changed in the last decade, either on the freethought side or the Christian side. “Does God Exist?” This was the topic at a public debate I attended on Monday. Here’s a brief summary. See how you would respond to the points that were raised. 1. Agreement with Data. We never have proof (outside of mathematics and logic), but we can provisionally accept the hypothesis that fits best with the data. 2. Coherence. A new hypothesis should be consistent with and support already-accepted theories. If not, it had better be a pretty compelling hypothesis. Simpler is better. 3. Scope. Broader is better. 4. Fertility. What new things can this hypothesis tell us? What predictions can it make? What new questions does it invite? The two speakers were Lutheran pastor Gary Jensen (also a member of Reasons to Believe, an old-earth Creationist organization) and humanist and lawyer Jim Corbett. I felt that Corbett won the event. Call me biased, but his arguments were much more concrete. Rev. Jensen was comfortable speaking to the crowd of roughly 200 people, but his arguments were shallow. I’ll do my best to give highlights of each speaker’s points. For Rev. Jensen, I’ll add occasional comments. He got to his first claim with a reference to the fine tuning argument, but he simply pointed to Just Six Numbers by Martin Rees. Okay, that’s a data point, but it’s hardly an argument. In talking about cosmology, he threw in the term “Darwinism.” Ouch—that may due to too much hanging out with the Reasons to Believe guys. He talked about God as a given and made a mistake that I see frequently—confusing statements about his beliefs (which he made) with an apologetic argument (which he didn’t). He says that he encourages free inquiry but that scientists who reject the supernatural are therefore closed-minded. He referred to information in DNA (that some protozoa have 200 times the DNA that humans do shows that DNA isn’t “designed” as we use the term) and absolute morality (that we see considerable social evolution from biblical morality to today’s morality overturns this notion). We have a moral responsibility to treat supernatural claims with skepticism. Otherwise we open ourselves to every snake oil salesman. Religion is the only impediment to science education in America, and science education is tied to national security. We’ve found clues of python worship in Botswana from 70,000 years ago, our earliest evidence of God of the Gaps thinking—that is, God lives in the gaps where science says, “we don’t know.” In this pre-scientific world, this was understandable and even laudable. But in the 21st century, it’s inexcusable. When Christianity was in charge, we called that the Dark Ages. One imam helped stifle the Islamic Golden Age, and we’re seeing the same thing in America. Corbett concluded with an interesting parallel. It took about 300 years from Christianity to go from nothing (death of Jesus) to being the official religion of the Roman empire (Council of Nicaea). If you count Darwin’s Origin of Species as the beginning of modern atheism in the West, we’re halfway through our 300-year transition period. Polls indicate that religion is declining, new knowledge explains away God, and God of the Gaps thinking is no longer necessary. I’m not sure if that should be seen as optimistic (we’re making good progress) or pessimistic (we have a long way to go) or even unrealistic (Christianity has weathered storms before and we mustn’t count it out), but it’s an interesting parallel. I’m a big fan of Dr. Robert Price’s Bible Geek podcast as many of you know. If you’re interested in the Bible and the culture from which it came, this podcast is a fire hose of information. His other (more recent) podcast is The Human Bible. I recommend both. 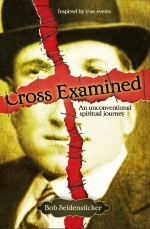 On a recent Bible Geek podcast (scroll to 5:45), Dr. Price was good enough to give a review of my novel, Cross Examined. Back in the character-based Stone Age of the personal computer, all IBM-compatible MS-DOS PCs started up with a C-prompt, the “C:\>” text with a blinking cursor. At least, all PCs that weren’t broken. Can we conclude anything from that? That “C:\>” is a reflection of some supernatural or transcendental truth? That it is an insight into God’s mind? No—it’s just a useful trait shared by this class of PCs. There’s no objective meaning behind these characters. This text is useful (it shows the directory in which any typed commands will take place), so it was selected. There’s nothing more profound than this behind it. Human morality is like this. Almost all humans have shared moral instincts, not dissimilar from instincts in other animals. Through instinct, honeybees communicate where the nectar is, newborn sea turtles go toward the ocean, and juvenile birds fly. Training or acculturation can override human instincts, of course, but in general we have a shared moral sense—a shared acceptance of the Golden Rule, for example. We think our moral instincts are pretty important, and that’s understandable, but there’s no reason to imagine that they are objectively true—that is, based on some supernatural grounding. Said another way, we think that our morality is true because it tells us that it’s true, but we can’t infer from this that it is grounded outside us. We must not confuse universally shared moral instincts with universal moral truths. Human moral instincts are what our programming says they are—it’s no more profound than that. There’s as much reason to imagine that they are a window into the transcendent as that the MS-DOS C-prompt is. Remember the 2011 film Anonymous that questioned the authorship of Shakespeare’s plays? It argued that William Shakespeare was just a front man for the true author, Edward de Vere, the Earl of Oxford. Modern historians have proposed several candidates besides Shakespeare himself, who some have argued was illiterate. So we don’t know who was perhaps the most famous and influential author in the English language? Shakespeare only died in 1616, we have a good understanding of the times, and he wrote in Early Modern English, and yet there remains a gulf of understanding that we can’t reliably cross. And we flatter ourselves that we can cross the far more daunting gulf that separates us from the place and times of Jesus so we can accept the far more incredible claims of the gospel story. Let’s see how reliable our modern New Testament is. We’ll follow it back in time to track the tortuous journey on which it has come. This post will go back to the Council of Nicaea in 325 CE, and later posts will explore the hurdles between that point and the life of Jesus. Our first step is to get past the translations. In English, we have dozens of versions—New International Version, American Standard Version, New American Standard Bible, and so on. Some Christians prefer the more archaic King James Version even to the point of arguing that it alone is divinely inspired. Proponents of different versions find plenty to argue about. Translation is especially difficult with a dead language like New Testament Greek since text examples are limited and there are no living speakers to consult. Consider an English example: the idiom “have your cake and eat it too” interpreted 2000 years in the future. Or “saving face” or “kick the bucket” or “throw in the towel” or “get your comeuppance.” If given only a handful of examples, future interpreters would have to guess at the meanings. Let’s look at similar problems in the Bible. Consider the Hebrew word reem, translated nine times in the King James Version as “unicorn.” For example, “Rescue me from the mouth of the lions; save me from the horns of the reem.” It’s now translated as “wild ox,” so perhaps we’ve got this one resolved. But what other rarely used words and phrases have been misunderstood? With no authority, we have nothing more than our best guesses to rely on. A bigger question is: what is “the Bible”? That is, what is canonical, the books accepted as scripture? The Christian church is not unified on this question. For example, Protestants accept the fewest books. The Roman Catholics add two books of Maccabees and Tobit (and others), the Greek Orthodox church accepts those and adds the Prayer of Manasseh and Esdras (and others), and the Ethiopian Orthodox church accepts those and adds Enoch and Jubilees (and others). In other words, Christian churches themselves can’t agree on what books contain the inspired word of God. Our next challenge is to find the best original-language copies. The King James version was based on the 16th-century Textus Receptus (“received text”), which was a printed version of the best Greek New Testament texts known at the time. More Greek manuscripts have come to light since then, and modern scholars rely on a broader set, so let’s discard the Textus Receptus and focus on those instead. Many apologists point proudly to the thousands of New Testament manuscript copies we have today—roughly 5000 Greek manuscripts and lectionaries (collections of scripture used during church services) and close to 20,000 manuscripts in other languages (mostly Latin, but also Ethiopic, Slavic, Syriac, and more). This compares with just 600 copies of the Iliad, our second-most well-represented ancient book. These are impressive numbers, but too much is made of them. Many of these are incomplete fragments—especially the oldest and most important—and almost all are far removed from the early church period. Suppose scholars discovered a library with 1000 previously unknown Latin Bible manuscripts from the 12th century. This would be quite a find, but these late manuscripts wouldn’t override the content from the best and oldest handful. Today’s 25,000 copies tell us little more about the originals than would having only the most reliable and complete 25 copies. While there are fragments of gospels going back to the second century, for complete copies we go to manuscripts such as the Codex Sinaiticus and Codex Vaticanus. These are our oldest copies of the New Testament, and each was written in roughly 350 CE, perhaps as part of the newly approved canon from the Council of Nicaea. We’ve still got a long way to go before the events in the life of Jesus. It’s like we’re looking the wrong way through a telescope.